Economists agree that by definition a currency must possess three qualities. It must serve as a medium of exchange, as a unit of account and a store of value. There has been a great deal of debate around the status of Bitcoin as a currency and the essence of the debate is that while it has just began to serve as a medium of exchange (possible but debatable) it is not a unit account or a good store of value given the rapidity with which Bitcoin prices fluctuate. Jason Kuznicki at Ordinary Times wrote a brilliant piece last year in December that used historical Bitcoin prices and three graphs to numerically show how Bitcoin failed the medium of exchange, the unit of account and the store of value tests. We thought it would be interesting to see if 11 months down the road, post the last Bitcoin price crisis, if the trend has changed or improved for the better. In economics, an object works as a medium of exchange if there is a general consensus that the object will be used for trade between parties. The current argument against Bitcoins is that while users, numbers of accounts, total market value in circulation have increased, its acceptance as a medium of exchange is debatable. Acceptance of Bitcoins as a payment mechanism is not sufficient, it must also be used to conduct transactions. It took the US dollar 170 years of usage to be accepted as a global medium of exchange post the second world war with all the support of a central authority (the US government and the Federal Reserve) behind it. For Bitcoins, it has just been 5 years. Broad based acceptance and usage also runs contrary to the original selling point of Bitcoin as a currency – total anonymity. At some point the two dimensions will collide. As the reddit discussion on a Bitcoin quora post makes the point: once you start buying physical, tangible goods on Amazon and start shipping them to your real world address, you can say goodbye to your anonymity. Jason’s first test divides the number of Bitcoin transactions by the total market capitalization of Bitcoins. We repeat the test with a minor change. Rather than looking at the entire price series, we break it down into three segments corresponding to each of the three historical Bitcoin price bubbles witnessed so far (2011, 2013 & 2014). In an earlier post we dissected Bitcoin bubble price history to identify possible trends using pre and post bubble prices, volatility, number of transactions and market capitalization behaviour. We now apply Jason’s medium of exchange test using the same methodology. We find that while plotting absolute numbers presents a different picture, Jason’s test show a completely different result. 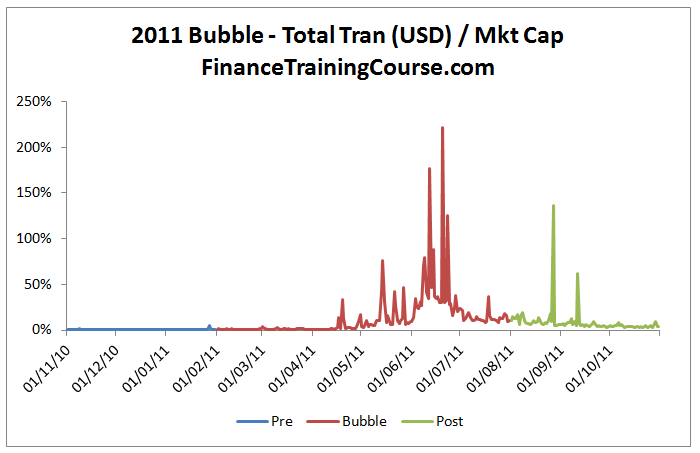 Across the entire series as well as during individual pre and post bubble periods there is no change in the original trend. 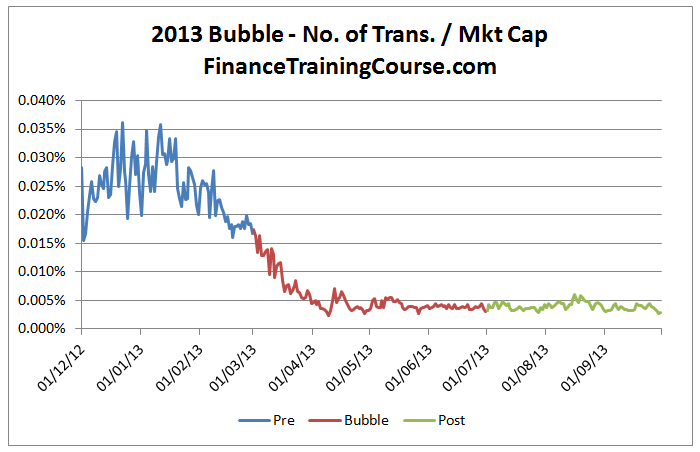 Number of transactions divided by total market capitalization is heading south. 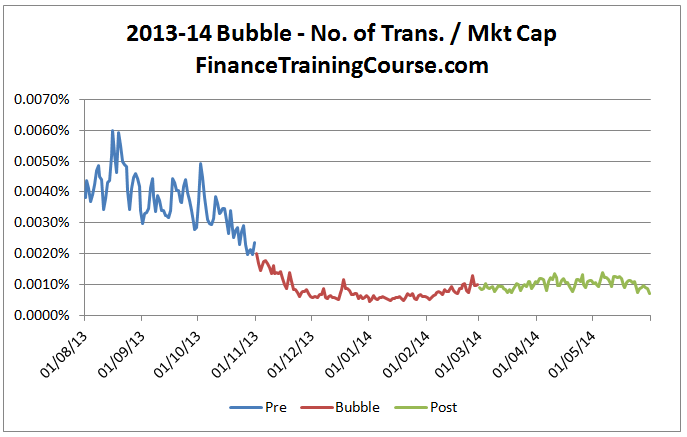 While we do see a slight uptick in the trend in the post bubble period in 2014, but it is not significant enough. The counter argument to Jason’s test results is to plot the same graphs for precious metals. Gold, Platinum, Silver and unpolished diamonds. You can’t take a bar of Gold to Target or Wall mart and head back home with groceries and change. You have to first convert your hoard into a currency acceptable for trade at your local neighbourhood store before you can use it. As per Jason’s test Bitcoin fails the medium of exchange test at this point in time. But given the counter argument if Bitcoins passes the unit of account or store of value test, will that serve our purpose? The unit of account test is a simple test. Would you keep your books of accounts in Bitcoins? Working with the most volatile emerging market currencies we see that local transactions, accounting and financial reporting happens within that currency, despite their volatility. Because within that geographic unit or domain, that currency is the primary medium of exchange. So till Bitcoin becomes the primary medium of exchange in a given domain, it is unlikely that we will see it being used as a unit of account. Till it is used as a unit of account, we will continue to see price cycles, volatility and instability in prices. Which comes first, stability or usage? To be fair we are not sure. One would think stability would lead the way since price discovery and transparency leads to stability but that is because tangible, physical exchanges lead to acceptance of a unit of exchange. How would that work in a truly digital world is where the uncertainty comes from. For now it would be safe to say that Bitcoin fails the unit of account test. We know that the maximum quantity of Bitcoins is set 21 million. While the current number in circulation is around 13 million. So M is a constant at a given point in time. 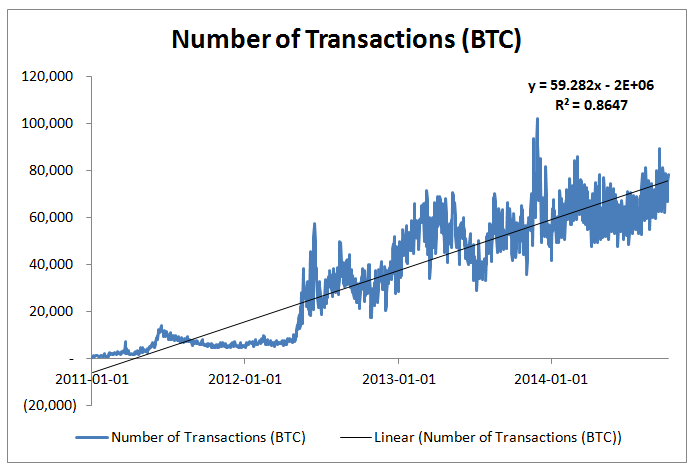 The numbers of transactions conducted using Bitcoins are on a rise, as portrayed by the graph above so the ‘T’ in the equation is rising. For determining velocity we use Jason’s methodology described in the paper referenced above. Bitcoin velocity is determined by the ratio of transaction values in US dollar and Bitcoin market capitalization. 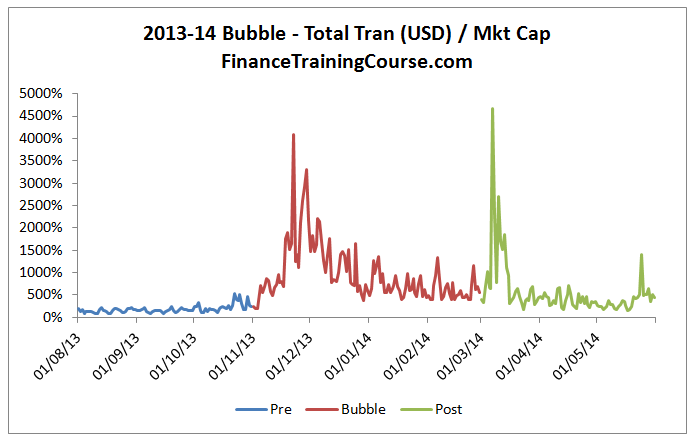 We plot the ratio separately for all three Bitcoin price bubbles. 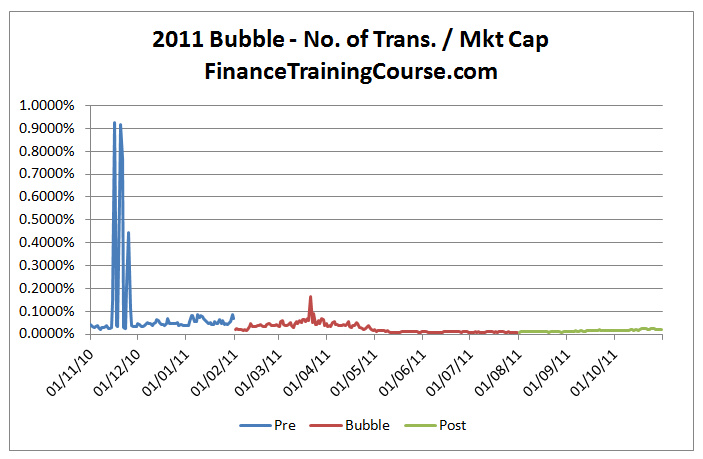 You can clearly see the sharp rise in velocity for all three bubbles. 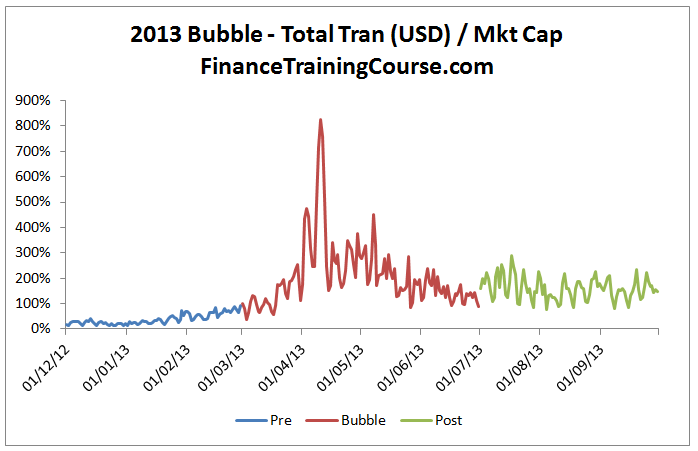 And the rise stands out given the stability in the ratio in the pre and post bubble dataset. What is interesting though is the 2014 chart that shows a second resurgence before levelling out in the post bubble period. Taken together acorss all three timeframes the overall trend for V is a slightly rising trend. We know that ‘M’ is constant, ‘V’ is slightly increasing, and the number of transactions, ‘T’ is on the rise. The equation therefore predicts, in order to balance the equation, price of goods, ‘P’, must fall. This is the point where economics steps in and suggests that given the decline in prices (goods) an economy based around Bitcoin will be a deflationary economy. Goods prices will fall, Bitcoin prices will rise and the holders of Bitcoin will have no incentives to spend their Bitcoin holdings because they will simply get more valuable with the passage of time. Along the same lines as the seminal babysitting vouchers paper written by Paul Krugman on suggesting ways to spend your way out of a recession in 1998. Is there a catch? Yes there is, rationale behaviour. But more on that later. For now let’s ask a simple question. Does Bitcoin really needs to be categorized as a currency? Does Bitcoin value as an asset or an investment erode if it isn’t a currency? What does that do to the medium of exchange, store of value and unit of accounts arguments. Do the same arguments apply to commodities, precious metals and other investment classes? If we can’t buy groceries with gold, or consume it like grains and cereals, what really drives the value of gold or any other precious metal? What path would Bitcoin need to follow to be recognized in the same class of assets over the next few years. Think about it. We will come back to it in the next post in our series.